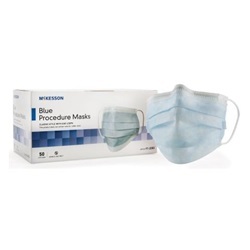 Pleated blue Mask has flexible nose piece and elastic ear loops. Fluid resistant. Level 1 barrier. One size fits most. Manufactured by McKesson. Comes 50 per box.